This is all we had in measly Portland, Oregon. And what is that, you might ask? 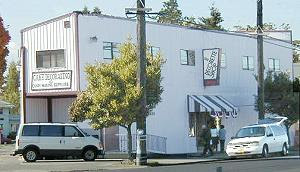 That is Oregon state's solitary Decorette Shop, all 300 square feet of it-don't let the upstairs fool you! And, don't believe what they say on the 'about page' about being knowledgeable, not true at all. Now... 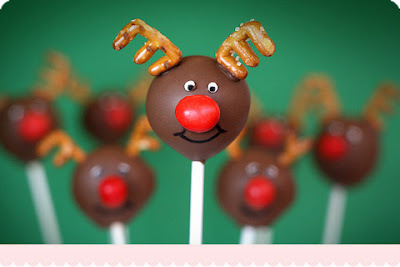 I don't adore Bakerella because of her darling cake pops, or her intensely creative spirit, though all good things. I adore Bakerella because of her insatiable genuine personality that shines through every blog post. However, when she posted her blogs: Where I shop Part 1 & Part 2 & Part 3, I uncovered another emotion I had for Bakerella: Envy. What a lucky girl!! At Gygi I had to control myself, not a behavior I'm all too fond of. But, knowing I could return in the very, very near future, and knowing what an indulgent husband I have, I simply selected a few wonderful and much needed items and in honor of Bakerella, I picked out some lollipop sticks and copied her pick for darling cupcake liners! Now I can say, finally, lucky me! I presume most of us start eating dessert early Thanksgiving morning; I know I do. This tradition started as a child - I remember watching my Mother every Thanksgiving Eve rolling out pie dough on the huge black countertop in my parent's home. There were two heaters in the kitchen, one on each side of the room; Pammy and I would sit, each of us on one heater vent, opposite sides of the room, knees pulled up to our chest, tshirt pulled over our knees and down to our feet, monopolizing all the hot air to ourselves... and there we would wait as she would cut the ingredients and flour the counter. As soon as she started rolling it out we would hop up, sneak several handfuls dipping them in cinnamon sugar as she decorated the crust and filled the dough with delicious fillings. So after a cozy sleep dreaming of pie, we could nothing to stop ourselves from whipping up a bowl of fresh cream to get our first taste of Thanksgiving Dessert, first thing in the morning. Why would we? I hope you get lots of pie today; I know I will! I copied this video from my sisters blog. Without sounding trite, I was truly touched by this video. I feel it embodies the purpose of giving thanks, and expresses better than I could articulate, the feelings I have for the wonderful blessings I've been given in my life. Too often I find myself wrapped up in the things I hope for - the things I wish I had, but I have been reminded lately the journey is the purpose and the joy is in the journey; finding bliss regardless of circumstance. Don't lie and tell me you haven't noticed the quality of my photos have taken a drastic turn for the worse. It's depresses me; who wants bad pictures of food? It just looks like bad food. What I can give you, however, is a review. The concept of Dream Dinners is a modern answer to the dinner time dilema. Step 1: Once a month make an appointment, or even better, once a year make an appointment for a revolving date for 12 months. Step 2: Hang out at Dream Dinners for a few hours and simply prepare meals for an entire month. 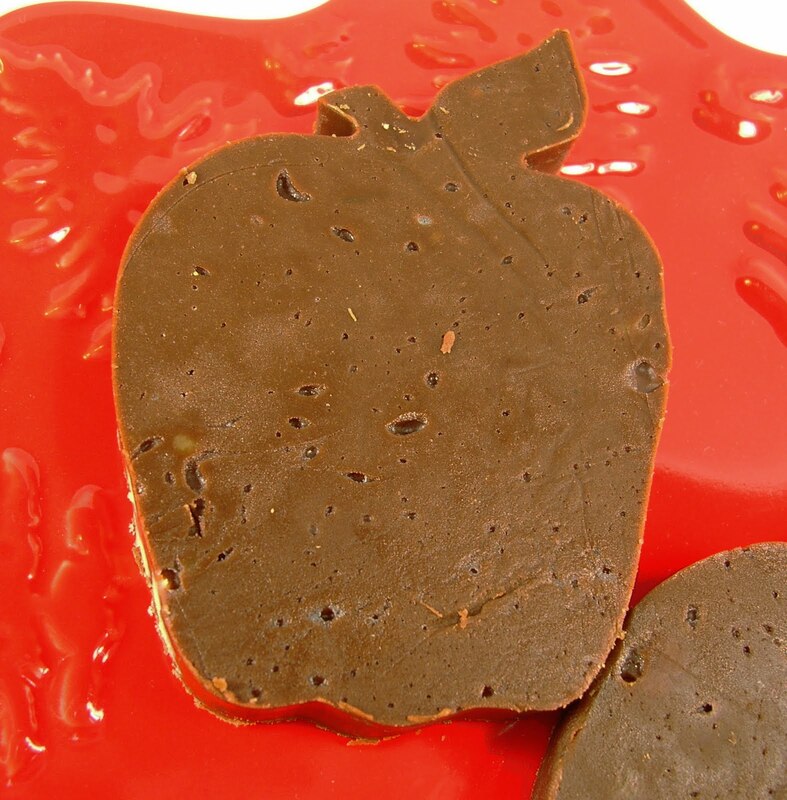 Step 3: Seal them in a plastic ziploc, adhere a plastic recipe tag, and take them home to store in your freezer. Dream Dinners has all the ingredients, spices and items you need to make all your meals right there in their kitchen with easy to read recipes and instructions. 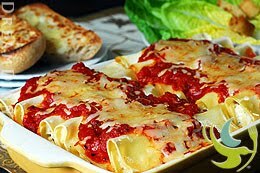 By the time you leave you will have all the dinners you need for the whole month ready to go in your freezer, and in just a few minutes at home you can present your family with a delicious dinner. Danielle Mahoney and Jean Colarusso were great hostesses. They sent me home with three meals to test out: Kentucky Pork Chops, Lemon Chicken Piccata, and Savory Honey Grilled Chicken with Sesame Honey Butter - the Honey Grilled Chicken was my favorite. 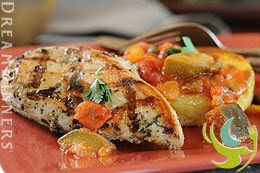 Each meal was simple to prepare, equally easy to store, and fabulously convenient. While I do recommend Dream Dinners the prices were a bit steep for me, personally. My three meals, three servings each, retail at $30 for entrée only. Adding the convenience and ease, in conjuction with the peace of mind knowing that dinner is always taken care of is something that definitely offsets the price, but naturally would have to be evaluated by each individual. 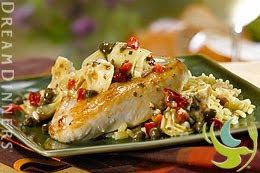 Consider also that while you are preparing the meals in the Dream Dinners Kitchen, you are cooking them at home - so while you escape the mess of prep, you can not avoid the mess of cooking or eventual cleanup. One of the perks, is that Dream Dinners has a Menu Launch Party each month for customers to preview eight dishes on the menu before blindly deciding on meals, a service that is free provided by the kitchen. Upcoming launch is Wednesday, December 2 @ 4:00 pm. Another great perk is that the menu offers a veritable selection of choices, not to mention changes each month so you aren't eating repetitively. Also, because the kitchen is open by appointment only, you aren't sharing the kitchen with strangers whose habits you don't know. Moreover you can get together with friends and prepare your meals together for the whole month; something I was able to do on our review night which I can attest is a lot of fun! The best news is that you can win a Session Sampler, valued at $75, by visiting the Orem Dream Dinners blog! (Contest was scheduled to be up on the 24th, so keep checking in!) If you don't win, or can't wait for the annoucement, mention Fahrenheit 350° and get 5% off your first order. 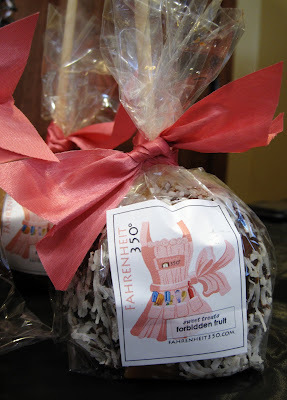 Fahrenheit 350° Blogiversary Celebration Giveaway! 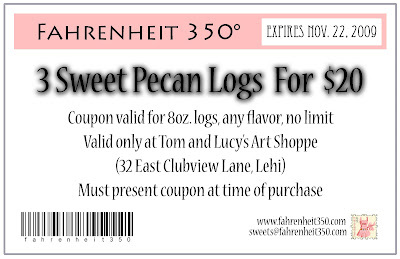 Plus, 3 Tasty Pecan Sweet Logs from Fahrenheit 350°! I sure know how to throw a party don't I? Contact me by end of day Wednesday, November 25! You know what I'd like to win? 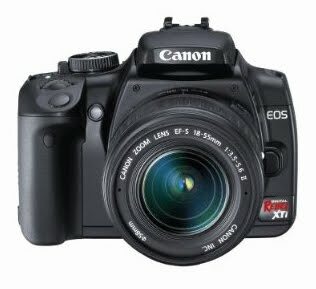 A new camera! P.S. Today is exactly 1 month until my birthday! Grab a coupon, and hurry over to Tom and Lucy's! Twilight Caramel Blood Red Apple Pecan Logs, Twilight Buttons, and more! by local artist Gabriel Olson? Even better - Tom & Lucy are having a Twilight party tonight from 4 pm to 9 pm! 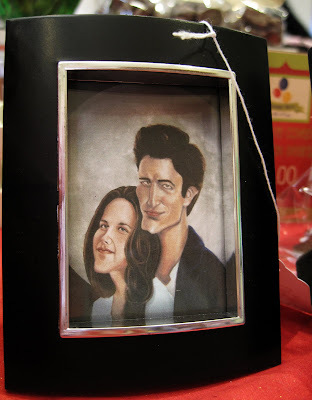 with giveaways, treats and all twilight all night! And of course, Fahrenheit 350° Sweet Logs! *If coupon won't print, just mention it when you come into the shoppe! It's the Best Boutique in town! Twilight Night Friday Night! Prizes, Merchandise, Party Galore! And just for my favorite readers: a coupon to use at the Art Shoppe! Right click on image to open in new window, print. If the coupon won't print (sorry!) 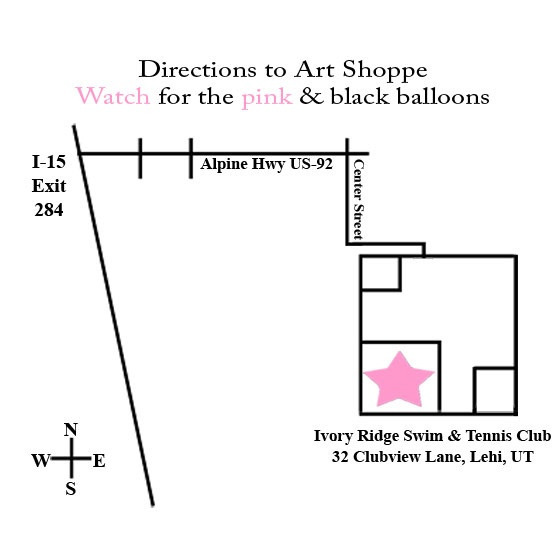 just mention it when you come to the shoppe! 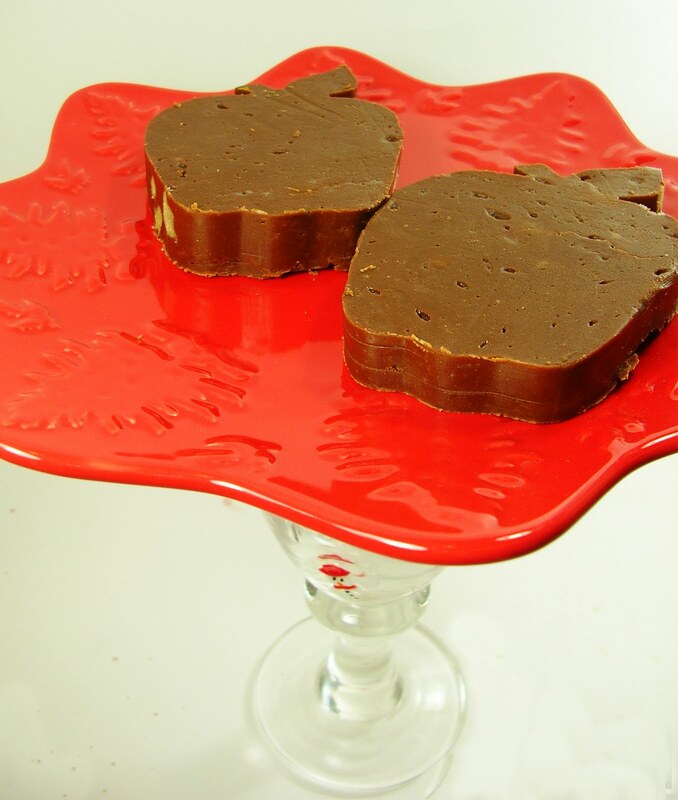 and... Chocoately Fudge that would satisfy any vampire! We live exactly 6 hours and 12 minutes from Las Vegas, by car. I'm not really a big "Vegas" fan, but the sound of a weekend vacation and an all you can eat buffet really had my ears ringing. We even almost booked a hotel at MGM; they were having a weekend special: $73 dollars a night + 1 night free... but we've decided to stay home. One of my favorite things about the holidays are the limitless potential they hold, whether home or away - for such things as dessert buffets. Last week, during my blogiversary celebration (which today is the last day to enter btw), all of my featured bloggers donated fabulous buffet recipes, not to mention the treats themselves! 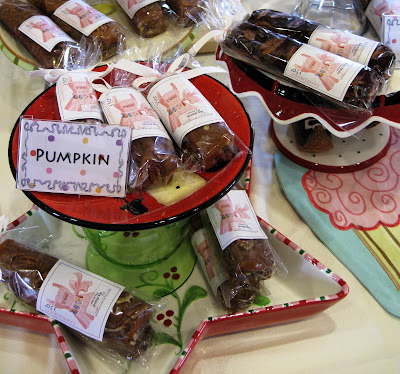 From Biscotti to fabulous cookies and more fabulous Cookies to Muffins to Toffee. 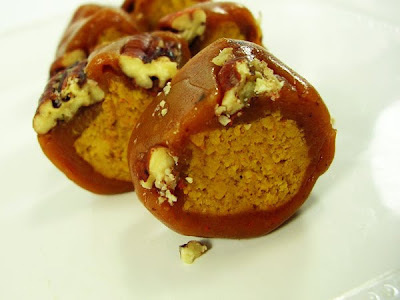 This is also a great treat to serve guests before your feast, as a thank you if you are celebrating at another person's home, or for stocking stuffers for next month! 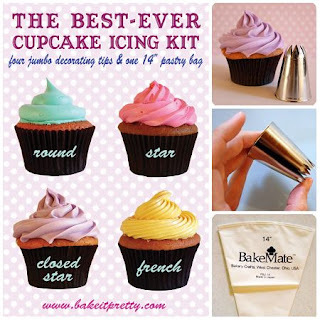 Amanda at Bake It Pretty has donated: The Best Ever Cupcake Icing Kit! This icing kit comes with four jumbo decorating tips and one pastry bag = everything you need to create stunning cupcakes! 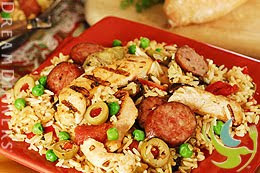 This is always a crowd pleaser! Lisa at Cupcake Wrapture has donated: 5 packages of cupcake wrappers! 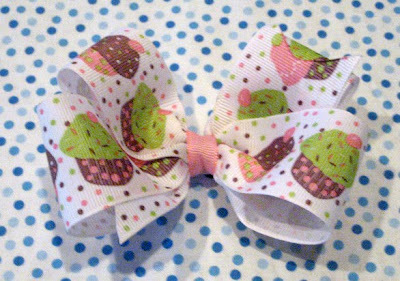 These adorable cupcake wrappers are like skirts for your cupcakes; they simply slip around your cupcake base and dress up any party! They are reusable, 2 sided, and perfect for any occasion! 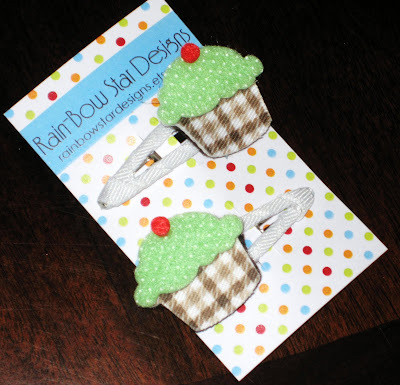 Teresa at Rainbow Star Designs has donated: 2 sets of darling cupcake hair clips! These clips are the perfect accompaniment to any outfit - adult or otherwise, and will let everyone know just how sweet you are! Shannon at Goldilocks Barrettes' has donated: A slice of vanilla birthday cake with strawberry filling and chocolate frosting barrette! This birthday cake will remind you all year just how special you are! 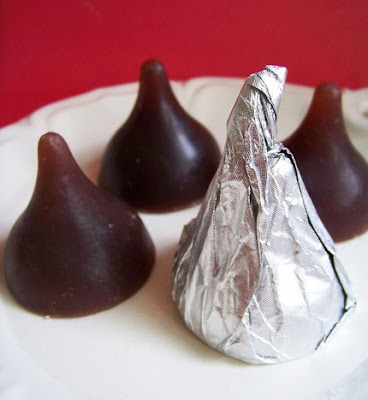 Leeana at Love Lee Soaps has donated: A Hershey's 2oz. Kiss Chocolate Soap! Lather up with this chocolaty delight and smell like heaven all day long! 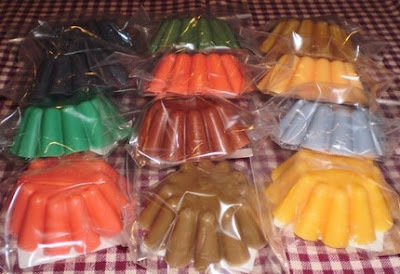 Jana at Candle Lynn Co. has donated: 12 Candles shaped and scented like your favorite Tartlettes! These candles will energize and lift up your spirits all day long as their aroma fills your home with their sweet scents! Sisters Angela and Brittany at Baby Blue Skie Designs have donated: 6 Pie Charms! 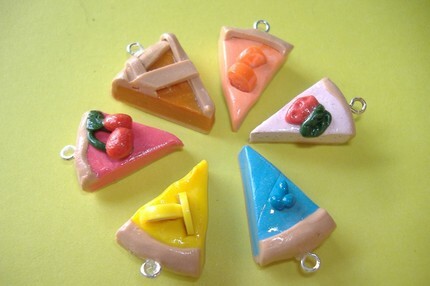 These interchangeable pie charms will look darling on a bracelet or necklace! Not to mention, they will always remind you to never forget dessert! 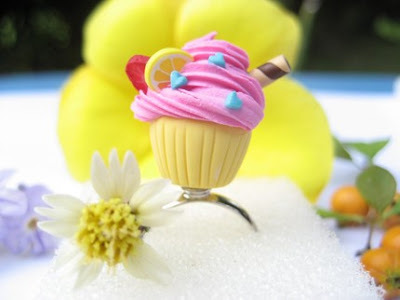 Helen at Bead Passion has donated: A Fruit Cupcake ring! Don't get confused by this darling hand crafted ring! It's so adorable it will make everyone jealous and hungry that passes you on the street! 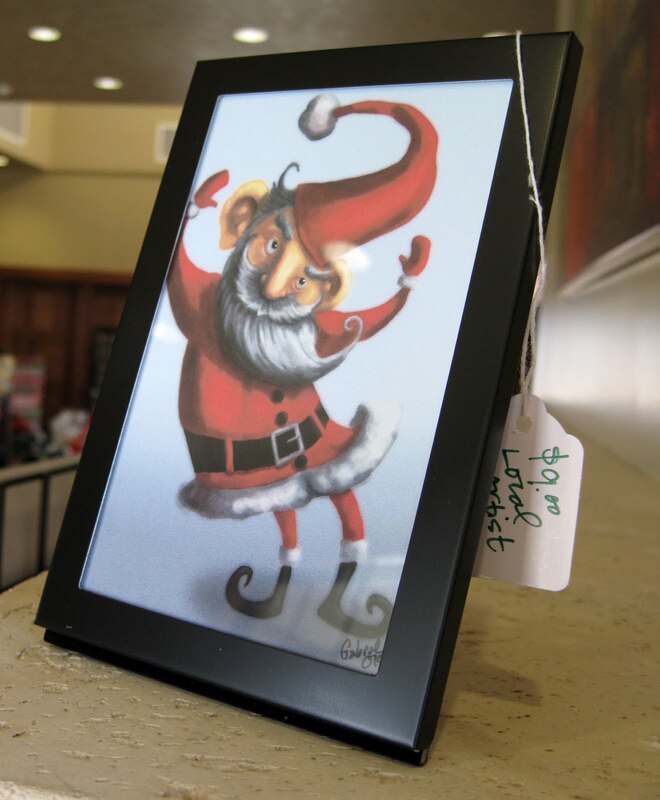 To enter this giveaway: Go to each featured artist's website and pick out something you'd love to have. Then come back and leave a separate comment on this post for each artist - receive one additional entry per comment, up to 8 entries today alone! Oh!, I almost forgot: I'm giving away three 4oz. 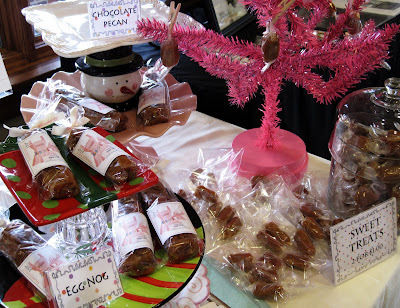 Holiday Sweet Logs! 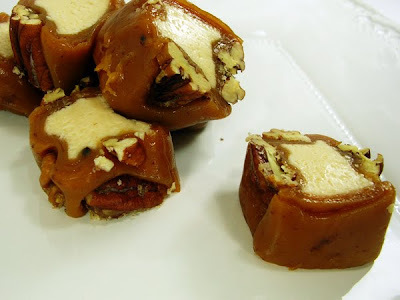 Egg Nog Pecan Sweet Log: Egg Nog flavored cream center encased in vanilla caramel and wrapped in toasted buttery pecans. 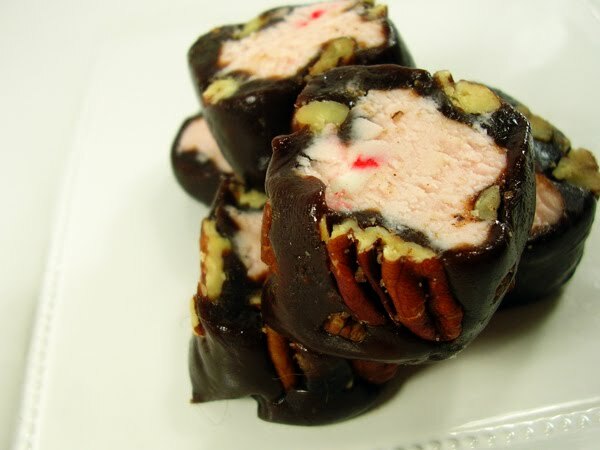 Candy Cane Pecan Sweet Log: A pink peppermint center interlaced with See's melt away peppermint candies, blanketed in chocolate caramel and toasted pecans. 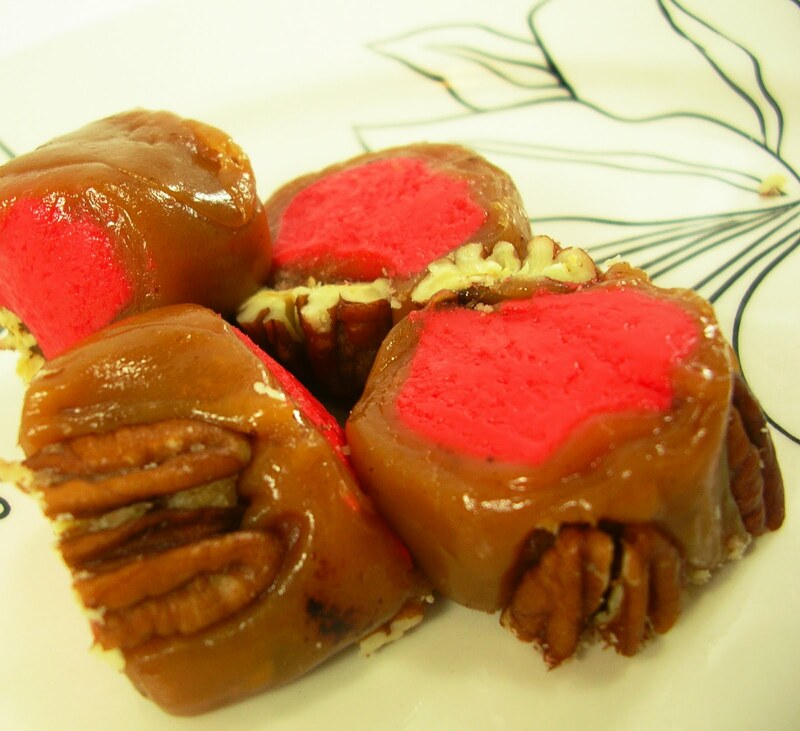 Gingerbread Pecan Sweet Log: A gingerbread candy center wrapped in delicious chewy caramel and coated in sugar toasted pecans! First time here? All this week I have been celebrating my blogiversary with prizes and treats and bloggers and giveaways! Everyday something new was up for grabs, and everyday you can enter to win! Today is the last posted part of the giveaway, but you have until Tuesday, November 17th to enter each and every giveaway. ONE very sweet winner will win everything featured this week selected by random.org! That could be you! You, could win everything! Just what are Lisa's main interests? 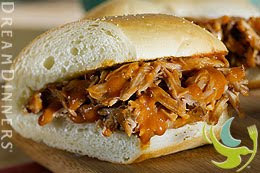 You got it: Baseball & Food; redolent, delectable and exciting masterpieces on and off the field! I met Lisa just over one year ago when I joined the Daring Baker's. She was the first person to welcome me to the group and the first to comment on my inaugural challenge. I've come to learn that my first impression of Lisa was spot on, she is genuine, thoughtful, and of course incredibly talented. 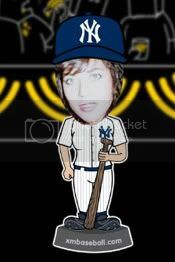 Lisa's tagline is: "A whole lotta food with a side of baseball'. Ultimately Lisa plans to open an adorable bistro/patisserie, but has been sidetracked by an unfortunate injury to her knee. 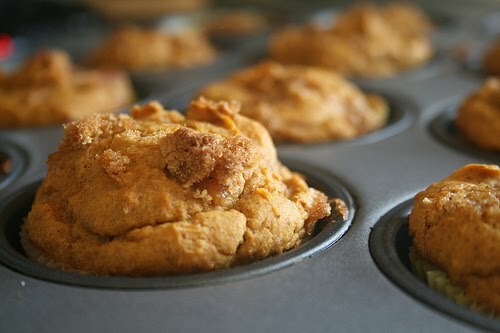 Though the injury has put a halt to her Grand Opening - surgery, the use of a cane, and immobility didn't stop her from baking. She simply improvised using a fondue pot as a stovetop off the couch. Now that is dedication! 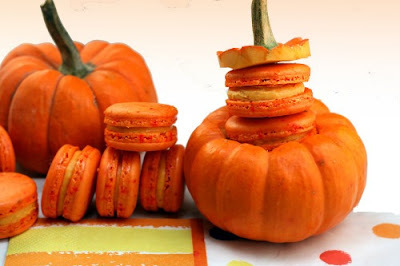 Are these not the most gorgeous macarons, you've ever seen, and pumpkin macarons at that? Yes please! Move over Tartelette! Admire this tuile inspired lemon meringue pie! 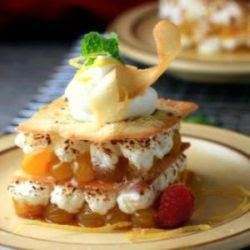 It is mouth watering with layers of lemon curd, meringue, and tuile cookies fashioned after a napoleon! 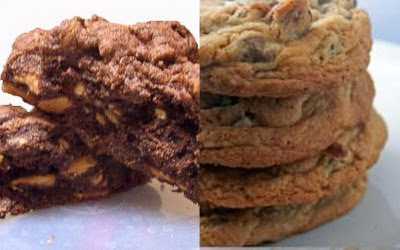 Lisa is donating her personal favorite dark chocolate peanut butter chip cookies and chocolate chunk brown butter cookies and a surprise treat revealed to the winner only upon arrival of the prize package! Are you expecting the recipe too? 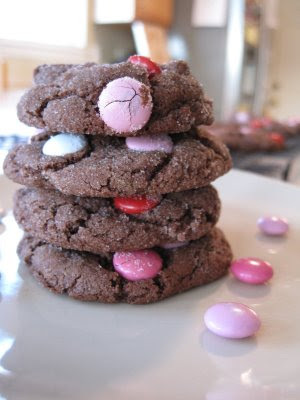 Of course she is donating that: Levain Bakery Copycat Cookies. At this point, you are wishing her bistro/patisserie was a reality - I know! So... to enter this giveaway head over to Parsley, Sage, Dessert and Line Drives and send Lisa some well wishes so she can get up, get better, and get moving! We need a Lisa Michele patisserie! 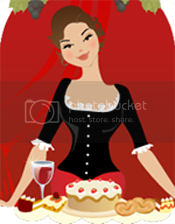 Then come back and comment here, letting me know what you would purchase at her patisserie! Be sure to enter everyday to increase your chances of winning every single door prize! Remember - ONE very sweet winner will win everything featured this week! That could be you! You, could win everything! Get lots of extra entries by reading and following the extra large fine print below! Door #Saturday is going to be huge! First time here? All week I am celebrating my blogiversary with prizes and treats and bloggers and giveaways! Everyday something new will be up for grabs, and everyday you can enter to win! The last giveaway will be posted on Saturday, and you will have until Tuesday, November 17th to enter each and every giveaway. ONE very sweet winner will win everything featured this week selected by random.org! That could be you! You, could win everything! Now... what does that cute little button on the right sidebar say today? We're going to celebrate and have a good time! One year ago: Under The Sea, Mermaid Cupcakes! It's the simple things people that are so exciting! Really! And just for the record, I prefer blogiversary, though I've been using them interchangeably. This celebration is well under way! 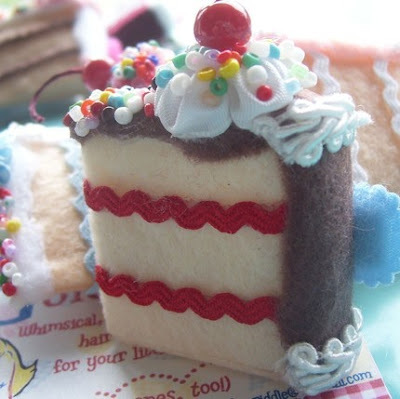 So far we've featured Pammy @ French Knots, Tracy @ Sugar Crafter, and Evan @ Butter Cakes, and each flirty little baker has generously donated something scrumptious to add to a fabulous blogiversary giveaway package! 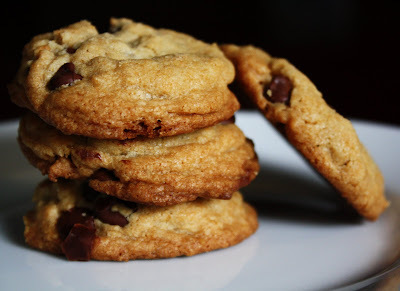 Door #Wednesday - Evan's Best Chocolate Chip Cookies... Ever... No Lie! Janet is the mastermind behind LaDue & Crew. I'd love to tell you how I met Janet and came across her impressively marvelous blog, but the truth is I don't remember! I have to admit, on frequent occasion, I definitely get lost surfing amongst the many waves on the world wide web; thus I found Janet! And can I just say, Hallelujah? 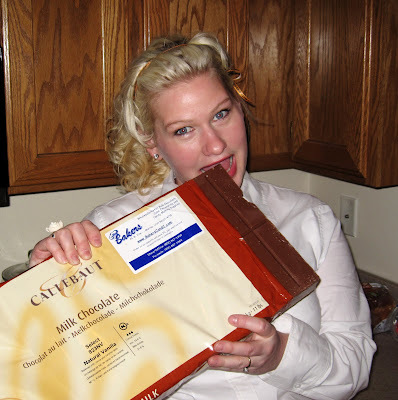 Janet has a humorous outlook on baking, on blogging, on life... in general. She is ambitious and daring, she is darling and hilarious, she is adorable and likeable. It's impossible to visit her blog and not leave smiling... well it's impossible to leave. Even better! Janet is donating her Cranberry Pistachio Biscotti to my blogiversary celebration! 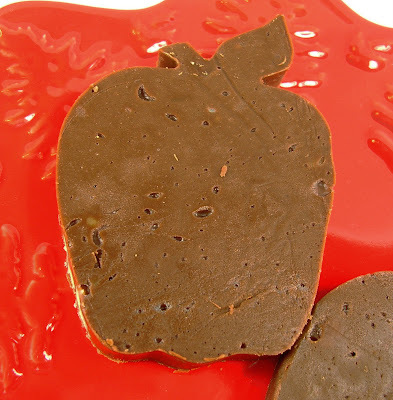 Can't you just imagine dipping this biscotti in chocolate and savoring each bite while escaping into an adventurous and delightful book? Sounds perfect to me! Enter this giveaway and that picture of perfection might feature you! Of course - Janet is donating the recipe too: Cranberry Pistachio Biscotti! To enter this giveaway: Visit LaDue & Crew and pick a masterpiece that you are dying to try! Then come back here and leave a comment telling me which one you love! And remember - get lots of extra entries by reading and following the extra large fine print below! What will be behind Door #Friday, and Door #Saturday? Make sure and come back to see what else you can win, and enter for more chances to take home everything featured this week! First time here? 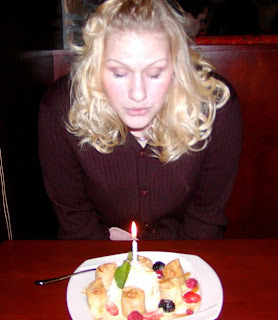 All week I am celebrating my blogoversary with prizes and treats and bloggers and giveaways! Everyday something new will be up for grabs, and everyday you can enter to win! The last giveaway will be posted on Saturday, and you will have until Tuesday, November 17th to enter each and every giveaway. ONE very sweet winner will win everything featured this week! That could be you! You, could win everything! Is it okay to say that Evan is my favorite? Sssshhh, don't tell Pammy or Tracy! Though Evan has a boy name, she is all girl, and who doesn't love a little sassy girl with a sporty attitude? I met Evan when I was searching for carrot cake decorations. Remember when I had my (one and only) TV debut?, on the elusive access cable television station? 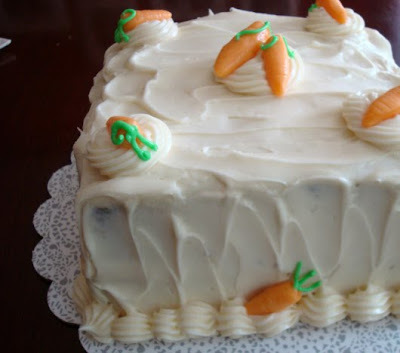 I was searching for ideas to really wow my fans, and I came across her gorgeous carrot cake with... Starburst carrots! ... and I knew immediately that we were long lost friends! Evan and I started emailing back and forth, and then we exchanged a couple voicemails; she has the cutest southern accent! Evan and I are great friends, we have a thousand and one things in common, and I can't wait to meet her! We have plans to go to the opening of the Harry Potter Theme Park together, and I am just itching with excitement! If you've been reading this blog for any time at all, you've heard me mention Evan. In June, I posted my favorite cake of hers (to date (...up to June)) of farm animals. 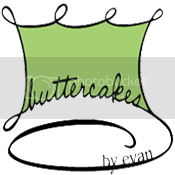 Evan has an incredible cake business, Buttercakes by Evan, in Mobile, Alabama. I send her orders all the time, but the problem is - she doesn't ship... she just teases and torments me! However, if you live within 50 miles of Mobile, she will deliver! Her blog is not only for showing off her incredible cakes, and ordering, but for giving away free tutorials on how to make incredible things from fondant, gumpaste, and other fancy etc. Evan also works as a pastry chef for a local restaurant in Alabama, so go get your sweet fix and then come back and brag to me... I'll probably cry! 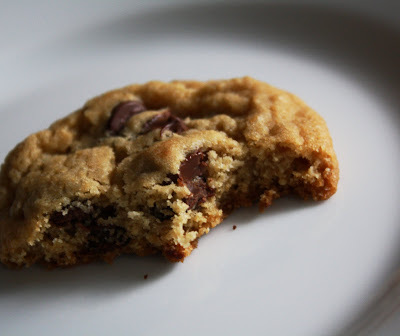 Evan is donating 1 dozen of The Best Chocolate Chip Cookies...Ever...No Lie... to my blogiversary celebration! Look at that picture! These have 2 sticks of melted butter in them! 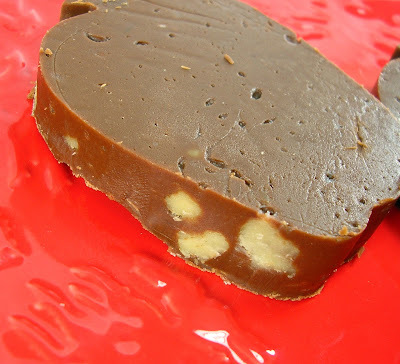 Have you ever had results like this with melted butter? Um, I'll answer that for you: No!! I'm telling you, she's amazing! To enter this giveaway: Visit Buttercakes by Evan and get lost in heaven. Then when you have regained consciousness, come back and tell me what you would order, what your favorite tutorial is, or just what you love over there! Make sure and come back tomorrow to see what else you can win, and enter for more chances to take home everything!